talk about text.soul.culture. this album is the perfect mix of the three. enjoy. but for a good taste enjoy this live stream of the newest hymns album. Thank you for your presence in my life over the last year. 2010 has been a good one! I’m very excited to see all that 2011 has in store for us all. Wishing you all the best in the new year! People always ask me about my homemade Italian red sauce or Pomodoro sauce. Honestly it is so easy that people almost don’t believe me. The key I always tell them is the ingredients. Particularly the tomatoes and the olive oil. I found this article recently comparing canned tomatoes and thought it was really helpful and something others might find helpful too. 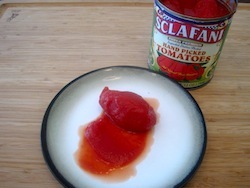 And don’t forget to note that Sclafani Brand Tomatoes are some of the very best! i love this translation of James 1:2-5. this has been a real encouragement to me lately! i love the phrase “your faith-life is forced into the open and shows its true colors.” i really believe in the idea of being authentic, not fake, and honest. and the truth is my journey of faith has not been one that i would ever describe as easy. as a counselor and pastor i am constantly challenging those i serve to “put their faith out in the open and to let people see their true colors.” it means share your doubts, tell the truth – life is hard, asking for help, etc. having lots of changes where I work, having had knee surgery, my wife having surgery, things being tight financially, along with juggling a 4 year old and a 2 year old, can make you wonder what in the world is going on some times. i’m thankful for my past that reminds me of God’s faithfulness in the midst of other past difficult hard times. it reminds me that God does provide and protect. and it reminds me that in the moment God is brewing something up for the future that is exciting. i hope this text finds you well and gives you some encouragement as it has to me. the truth is in the midst of the hard and the difficult there present with it is also the wonderful, exciting, and great things that are happening. God help me to see the both and. and help me to continue to walk humbly, moving forward with you!